Trailer ramp springs are heavy duty torsion springs which work as a lift-assist to take the majority of weight off of the gate/ramp/lid. You will find that design assistance here in this article. Free Position angle in which the trailer spring will be installed. The primary parameters you have to take a look at are those for the trailer ramp spring installation. The diameter of the shaft or mandrel is the first value you will take a look at. You will need the remaining parameters (length and weight of ramp) to calculate your spring rate of inch-pounds per degree. Make sure that the inner diameter of your torsional trailer spring will fit over the shaft. Next, you must take a look at the trailer spring's surroundings to make sure that the outer diameter of the spring will also fit. This is how you set the tolerances of your spring's dimensions, by knowing the minimum inner diameter and maximum outer diameter. Since the inner diameter of a torsional spring contracts upon deflection, you must also make sure that the deflected spring’s inner diameter will not contract on the shaft. If the deflected trailer ramp spring’s inner diameter contracts on the shaft, you will not be able to accomplish your desired amount of deflection or degrees of travel and you might cause the spring’s legs to bend/break thus damaging the spring. Last but not least, two equally important measurements you must take into account are the direction of wind and the free position of the spring. The direction of wind determines in which direction your spring will be traveling. The free position is the positioning of the legs by adding a fraction of a coil at the end of the spring so the legs make an angle. The images to the right give you various examples of these parameters. 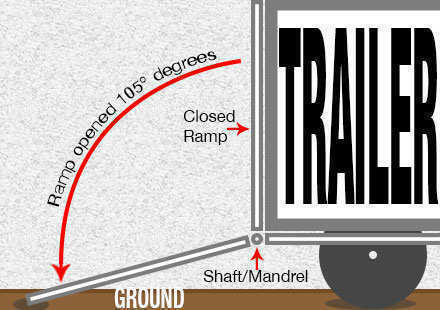 The next step is to calculate your trailer ramp spring's rate of inch-pounds per degree. In this step you may contact our engineers who may assist you in your torsional trailer ramp spring design. The ramp's dimensions and weight are required since that is the load that will be applied to the spring. 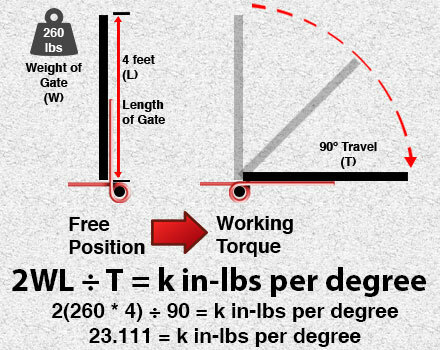 To calculate the exact weight the ramp/gate will be applying on the spring you must know the dead weight of the ramp (in pounds) when it is uninstalled as well as the length (in feet). Then, you must look at how many degrees the ramp will travel. 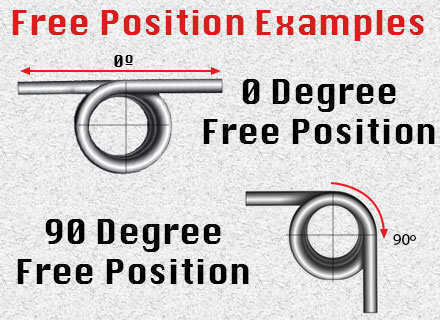 Having these dimensions, you can go ahead and calculate the torsion spring rate your springs will need to achieve during your working torque. The formulas combined together are as follows.